Laser dentistry is one of the most cutting-edge technological advances we have seen as of late in the dental health world. It has transformed the way dentists provide care for their patients and has become a great option for people that are looking to avoid drills during their own dental procedures. If you are unfamiliar with laser dentistry and how it works, it’s likely that you have a few questions. We decided to prepare the following article to provide answers to the most frequently asked questions about laser dentistry. The article is intended to help you understand the great benefits that laser dentistry can offer. If you are looking for the best in laser dentistry in Stamford, CT, look no further than Periodontics & Implant Dentistry Center, LLC. A dental laser is a device that uses highly concentrated beams of light to remove gum infection, eliminate tooth decay, or whiten teeth. It is a more comfortable treatment option that dentists can offer to their patients. That’s because it is less invasive than drilling and other traditional dental procedures. Procedures involving dental lasers are mostly painless. That’s because pain is usually caused by either vibrations or heat during dental procedures. Dental lasers actually avoid both! People who are fearful of the pain that might occur during certain dental procedures can stand to benefit greatly from dental laser treatments. What Are the Most Common Procedures that Dental Lasers Are Used for? Laser dentistry is great because it provides a lot of different options in terms of how it can be used. 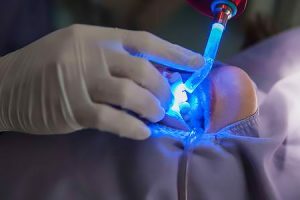 Some common procedures that dental lasers are used for are periodontal treatment, desensitizing teeth, teeth whitening, non-surgical gum therapy, removing dental decay, and sterilizing infected root canals. As a reminder, if you want to go to the best gum disease dentist in Fairfield County, CT, contact Periodontics & Implant Dentistry Center, LLC today. Can Laser Dentistry Prevent Tooth Extraction? With laser gum treatment, it is possible to save teeth that would otherwise need to be extracted. It depends on the unique situation in someone’s mouth. Laser dentistry does have the potential to help prevent a dentist from having to extract a tooth. It also depends on how good the dentist is using their laser. If you want the best in laser dentistry in Stamford, CT, contact Periodontics & Implant Dentistry Center, LLC today.